Only those inmates who entered the Nazi concentration camps at a youthful age are still alive today. Very young boys and girls were generally gassed as useless to the German war machine. The six brave women who populate Jon Kean documentary were about 18-23 years old when they entered Auschwitz. Some died since the making of this film and, as they say, time is running out. We cannot learn first-hand about the experiences of survivors for much longer, though thanks to the magic of celluloid, their testimonies will be with us forever. Eva Beckmann, Rena Drexler, Renee Firestone, Erika Jacoby, Lili Majzner and Linda Sherman were mostly from Eastern Europe: Poland, Czechoslovakia, and Hungary. One was from Holland. They discuss in part their experiences in 1945 after the British or the Russians liberated them, but most of the doc deals with their lives in the West, particularly the USA. Still it bears mentioning that the country that is supposed to be a haven for people who are yearning to breathe free was not too eager to issue visas given the anti-Semitism allegedly present in our own State Department. The one theme that runs through the experiences of the six women is that after they were freed from the camps, they could not return to their homes in Eastern Europe. Their property had been taken over by the locals and in some cases fellow Czechs dragged survivors through the streets, blaming Jews for the black market and yelling that they will never again see their living quarters. After a stay in Displaced Persons camps, many went on to New York and California, though the film is not clear how they dug up the money for flights, which were more expensive then than they are now. These women, bless them, might be able to sustain an 83 minute film by talking to the cameras, but thankfully archival clips take over about half of the running time, shifting back to the camps during the week of liberation where bodies, thousands of them, are piled up unburied. Destruction in Germany as we see here was so immense that Hitler’s order to destroy Berlin did not have to be carried out. That was presumably one command that the generals ignored from the madman. The women traveled around by train, and terrific archival shots show people riding on the top and on the sides of the carriers as though hoboes during the Depression or perhaps the way some in India travel third-class or even lower. All the new residents of the USA are pleased with the culture here, except for one who was urged to try Coca-Cola. She drank a glass, and that was the last time for her. Others went to the wider spaces of California. They married, had kids and grandkids. Some gave talks to classes in Hebrew school to youngsters kept in the dark by their parents, though despite the need the women have to teach others so that “it will happen never again,” they do not want to be obsessed with the bad times of the past. What shocks them most is that we haven’t learned. Just mention Darfur, Rwanda, Kosovo, Congo, Armenia. And as nations fall to right wing authoritarians today, we are bound to be faced by similar tragedies—to say nothing of the possibility of the extinction of humanity in a nuclear war. 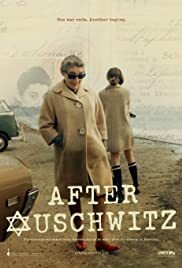 Jon Kean wrote and directs, a man whose “Swimming in Auschwitz” featured six women who kept their spirits and their faith alive during their months in Auschwitz-Birkenau. His “Kill the Man” describes the adventures of men who try to keep their company afloat while being stressed by the competition and by a visit from a thug.